The biggest change is the two of us are now three. 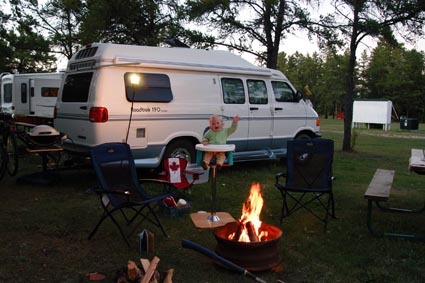 Our 15 month old daughter Willow May is part of the adventure and brings a whole new element to traveling in a camper van. 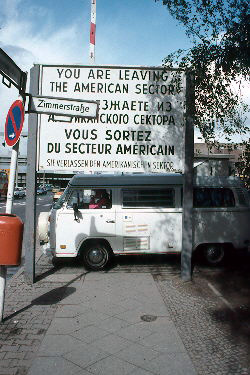 Needless to say, we needed a bigger van, the old VW Westfalia was great in it�s day (and great in our day), but it just wasn�t going to cut it for this trip. (If you�re curious, it�s now somewhere on a beach in Baja California). Enter the Road Trek 190, in my opinion the finest camper van on the market today. It is built in Canada and is rated the number one unit in the world, and for good reason. The manufacturer holds over 20 patents on their design innovations, ingenious ideas such as a lowered floor that�s actually the shower, an easily converted king size bed, and every amenity found in much larger units. All cleverly compact and uniquely constructed. Of course, anyone who knows me well, knows I�d never be satisfied with �out of the box�. I have spent many hours over the past few months modifying the living space to include an office complete with 2 laptops and full mobile internet access, GPS navigation and satellite radio, BBQ, upgraded cabinetry, integrated invertor power system and all sorts of little extras to make this trip just a little more comfortable then our previous one. ~The new Venturetour Van in Saskatoon. Visible in the sky are the Canadian Snowbirds, part of the Saskatoon Air Show. Our planned route should take us east from Calgary following the �northern route� across Saskatchewan and Manitoba picking up the Trans Canada at Winnipeg. Then on through Manitoulin Island to southwestern Ontario to spend a week or so with family. We hope to leave that area just after Labour Day spending some time in the Ottawa area then Quebec City and on to New Brunswick, PEI and Nova Scotia for the autumn colours. Our return route will take us through New England, upstate New York and back into Ontario before heading back west through the U.S. by mid November. My hope is to post regular dispatches from the road on this site, probably a week�s worth at a time. These will not be a day to day – play by play, but instead just the highlights of things that catch our eye and interest. Of course I will include a good dose of images to round things out. So I hope you check back often and enjoy tagging along. Your comments of course are always welcome. By the way, I will also be doing regular posts on Willow�s blog of her adventures. Feel free to check it out as well at www.willowwarris.com. 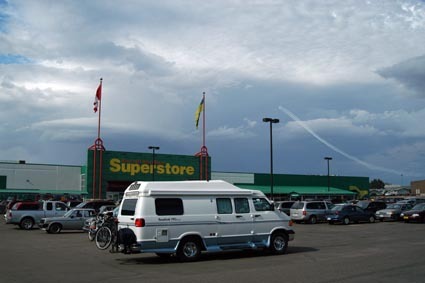 Pleased to receive your update on your trip.I’m sure Willow is enjoying her trip along with her parents.By the way Super Store is a little out of the norm for motorhomes to be parked at >>Walmart is the preferred choice. Cheers and enjoy your trip. you guyz are rock star!! !